Midsize SUVs like the 2018 Toyota Highlander are tailor-made for family road trips and adventures in the Bangor area. With third-row seating, a family-friendly cabin, unrivaled safety, a smorgasbord of innovative features and much more, the Toyota Highlander promises to be the perfect addition to your family. 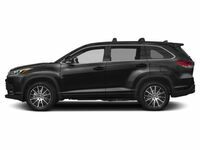 Learn more about the Toyota-brand midsize SUV with this 2018 Toyota Highlander vs 2018 Ford Explorer comparison. When you choose the 2018 Toyota Highlander as your next family hauler, you will have plenty of options with five available trim levels – LE, LE Plus, XLE, SE and Limited – that are made even more attractive when you upgrade to the Toyota Highlander Hybrid. With room for seven or eight passengers and 13.8 cubic feet of cargo space that will expand to 83.7 cubic feet with the rear seats laid flat, the Toyota Highlander can handle the neighborhood carpool or automotive chores with ease. What Are the Differences Between the Toyota Highlander and the Ford Explorer? What better way to see what the Toyota Highlander brings to the table at Downeast Toyota than a 2018 Toyota Highlander vs 2018 Ford Explorer comparison, that pits the Toyota midsize SUV against an automotive icon. Value and price are key components to any car-buying decision and with a more affordable price tag that starts at $31,030 and a wealth of standard features, the Toyota Highlander is a family favorite in a competitive segment. Toyota Highlander LE trim levels create tremendous value with a fuel-efficient 185-horsepower 2.7-liter four-cylinder engine, a standard 6.1-inch Toyota Entune™ touchscreen display, a rearview camera and Toyota Safety Sense™ technology. Armed with Toyota Safety Sense™, the Highlander will add a Pre-Collision System with Pedestrian Detection, Lane Departure Alert with Steering Assist, Automatic High Beams and Dynamic Radar Cruise Control. With this suite of advanced safety systems, the Toyota Highlander has earned an IIHS Top Safety Pick and a 5-star rating by the NHTSA.